Be the first to share your favorite memory, photo or story of James V. "Jim". This memorial page is dedicated for family, friends and future generations to celebrate the life of their loved one. Rev. 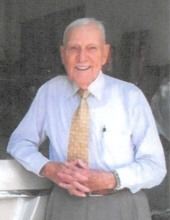 James V. “Jim” Chambers, 98, of Fayetteville passed away October 16, 2018. Rev. Chambers was born in Fayette County, on his mother’s 28th birthday, May 2, 1920. Rev. Chambers was a World War II combat veteran, earning two Purple Hearts and a Bronze Star, serving with the US Army in the European Theater of Operations. After the war, he was ordained as a Southern Baptist Minister. He served as Pastor of several churches in the Flint River Baptist Association, as well as the Dewy Rose Baptist Church in Elbert County. Rev. Chambers was a Chaplain in the Civil Air Patrol and served a number of years as the State Wing Chaplain with the rank of Lt Col. He is also the past Chaplain for the City of Griffin. Rev. Chambers held a Private Pilot’s License and enjoyed flying, hunting & fishing. However, given the choice to do anything on this earth, he would choose spending time with his family. Outside of his Lord Jesus Christ, he considered them his greatest achievements. Rev. Chambers was preceded in death by his beloved wife of 68 years, Ann Kelley Chambers; daughter, Patricia Ann; son, James Patrick; his parents, James and Nellie Chambers; and his siblings. He is survived by his daughter, Dianne Kanazawa; son, Tim (Charlotte) Chambers; grandchildren, Tonya (Shane) Jones, Ron (Lora) Johnson, and Kelley (Amanda) Chambers; great-grandchildren, Lane and Dylan Johnson and Emma Shane, Grant, and Rhett Jones. A memorial service will be held Sunday, October 21, 2018 at 3:00 PM in the Chapel of Mowell Funeral Home, Fayetteville with Dr. Jim Thomas and Rev. Jack Miller officiating. The family will receive friends from 1:00 – 3:00 PM prior to the service at the funeral home. In lieu of flowers, the family requests donations be made to the Children’s Ministry of Fayetteville First Baptist Church, www.fayettevillefbc.org, or the Wounded Warrior Project, www.woundedwarriorproject.org. To send flowers or a remembrance gift to the family of James V. "Jim" Chambers, please visit our Tribute Store. "Email Address" would like to share the life celebration of James V. "Jim" Chambers. Click on the "link" to go to share a favorite memory or leave a condolence message for the family. memory of James V. "Jim"